Silat is a term used to describe the martial art forms practiced throughout the Malay Archipelago. 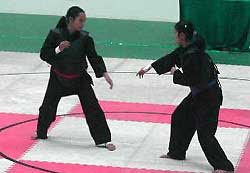 Silat is a combative art of Malay fighting arts and Silat is not only for combative purposes. It's the way of life. Orang laut, which literally means “sea people” in Malay, refers to the indigenous sea nomads and sea gypsies of Singapore. They were one of the earlier immigrants who settled along the coastlines of Singapore during pre-colonial days. 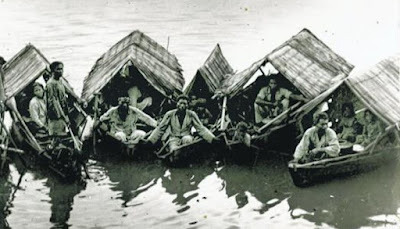 Living off the coast of Johore, they were the forefront of the defense to protect Johore from being attack from the sea. In the old days, the Orang Laut community lived in boats that they built and conduct their day to day activities in the boats. Due to the position of Orang Laut who knew the intricacies of the sea around the Straits of Malacca described in the History of the Malays to be among the busiest sea route, they played an important role in the reign of the Kingdom of Srivijaya, the Sultanate of Malacca and later to the Sultanate of Johore-Riau. Their duty as warriors or police in the sea led to a close relationship between the Orang Laut and the three royal institutions that had been established since the early days of the reign of Srivijaya kingdom. Orang Laut were also known as a very loyal group to the royal family of Srivijaya. In the 17th and 18th centuries, the Orang Laut continued to play an important role in the kingdom of Johor, until the regicide of 1699, which ended the Melaka lineage. The Malay rulers utilized the Orang Laut as rowers, men-of-war, and royal messengers.